The patriarch of the HDD industry, Western Digital, has been on firm ground on the market recently, it has a lot of distinguished clients, and tries to press its competitors wherever possible. It has been especially successful in the desktop storage segment, where WD is right behind the leader (Seagate) by the number of shipped storage devices. This company has recently started updating its model line of desktop hard disks. Judging from the specifications published on the web site, the new models are full of promise. One of their key features is higher-density platters — up to 107 GB per platter in top 320 GB models. 320 GB models are the first-borns of the new WD platter density. The manufacturer claims that the junior 40, 80, 120, 160, 200, and 250 GB models will gradually switch to these platters as well. Some of them will obviously have "clipped" platters, that is formatted for smaller capacity. Moreover, the company is going to release a 400 GB model, which will finally use the four-platter design (a lot of previous generations of hard disks from this company have limited themselves to three platters maximum). Not long ago we reviewed the first-born of the new WD generation — the WD3200JB with UltraATA interface. We lamented that the SerialATA modification would appear only later. And now we have an opportunity to fill in the blanks and review the senior SATA model of the new WD generation based on 107 GB platters. The WD3200JD drive on 107 GB platters that we used in our tests (manufactured on April 2005). The WD3200JD model belongs to the WD Caviar SE series and is classified by the manufacturer as High-Performance (that's the name of the corresponding category of WD storage devices). It also includes less capacious models with an 8 MB buffer — 300, 250, 200 GB and lower. Designations on WD drives still do not carry information on a number of platters and heads. So, during this transition period, that is until the production line switches completely from 80GB to 100-107GB platters, we can come across hard disk with the same model number, but with different platter/head configurations as well as different controllers (see below) and performance. However, WD tends to discontinue models with the same capacity and different geometries, that is a given capacity will definitely correspond to the number of heads. The current and future WD platter line is 80,100,107, (125,133) GB. The list of configuration options is as follows: 320 and 300 GB hard disks have three platters (107 or 100 GB correspondingly), less capacious hard disks of the new generation will be based on 100GB platters: 250GB model will have 5 platters, 200GB — 4 platters, and so forth. 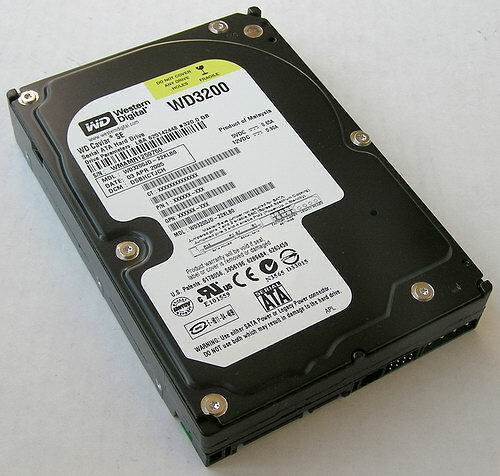 The WD2500JD of the previous generation based on 83GB platters, used in our tests (manufactured in late December 2004, bought in spring 2005 in a large store). As for now, you can still come across low end WD models (less than 300 GB) that belong to the previous generation (for example, quite a recent 250GB model on the photo above has three 83GB platters). We shall take this very model (WD2500JD) to compare it to the new WD3200JD. The manufacturer stresses that besides the increased capacity and performance, the new models are notable for their reduced heat dissipation (not only electromechanics, but controllers as well), lower operating temperatures and improved caching algorithms. The reduction of the operating temperature in these devices allows to raise their reliability in various configurations of modern systems in the long-term outlook — including consumer electronics with passive cooling only. Another interesting fact - these hard disks still use the same SerialATA 1.0 150 MB/s interface without NCQ support, though WD already announced SATA II models (300 MB/s, NCQ, and even an optional 16 MB buffer). For some unknown reason, capacities of SATA II models from WD are limited by 250 GB so far. They will soon appear in our lab as well. As for now, let's review their capacious predecessors, which use the same new platters. The key specifications on WD hard drives, taking part in our review, in comparison with their predecessors are provided in Table 1. Table 1. Key specifications on Western Digital Caviar SE SerialATA drives compared to those of their predecessors. Besides the increased capacity and data density, the new WD drives stand out against their predecessors by slightly increased linear transfer rates, less power consumption/thermal emission, and quieter (that is noiseless) operation. Non-operating shock of WD drives is still a tad worse than in competitors. Besides, the allowed operating temperature is a tad narrower — some manufacturers currently offer from 0 to +60 degrees. In return, the power consumption during data transfers is unprecedented low for a desktop 7200rpm drive. The model line also got shorter due to hard drives of small capacity. It was decided not to increase the buffer size so far and leave it at 8 MB, though 16 MB buffers are already available in Highest-Performance hard disks from WD, which are about to enter the market. However, WD promises that models with an 8 MB buffer will have the same performance as those with a 16 MB buffer — due to perfected caching algorithms. It's claimed that WD managed to reduce Caviar noise to the levels virtually below the threshold of human hearing due to the unique WhisperDrive technology. That's really true — the latest desktop hard disks from WD are much quieter than their predecessors. They are currently ones of the quietest 3.5-inch hard disks. To cut seek noise, the Soft Seek technology streamlines read/write seeking algorithms, resulting in the drive operating more efficiently. WD drives are manufactured on plants in Malaysia and Thailand. The manufacturer offers a three-year warranty for these drives. 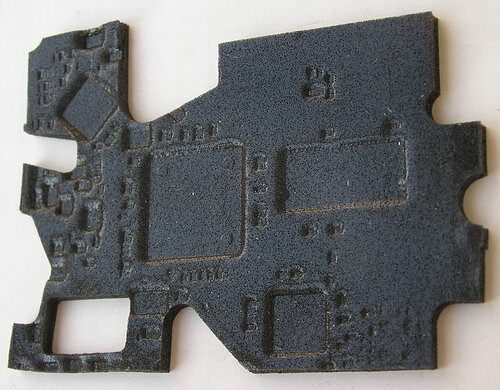 The WD3200JD model, bottom view and a pad between the controller PCB and the base casting. However, as on-board chips are specially optimized for lower power consumption and heat dissipation, this construction does not threaten the heat removal and overheating of PCB components. Besides, this padding probably serves as an additional heat sink that channels the heat from "hot" chips to the metal case. Controller boards of the WD3200JD (April 2005, on top) and the WD2500JD hard disks (December 2004, below), which take part in our tests. 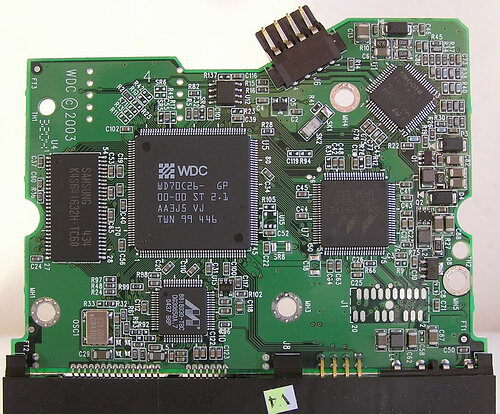 Controller board of the WD3200JD hard disk, manufactured in April 2005 (close-up). 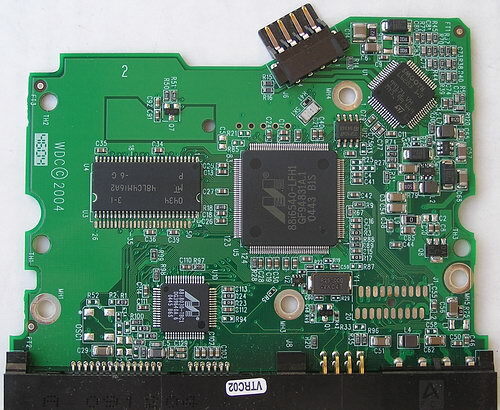 However, I don't rule out a chance that designers will upgrade this controller, as the model line of hard disks is updated, and use a Marvell processor with built-in PHY of the SATA interface (as some other manufacturers did). So, as the WD3200JD has the same processor as the WD3200JB hard disk with parallel interface, we can expect these models to be similar in everything (probably except for an insignificant difference in power consumption and interface rates — these parameters will be higher in the SATA model). "Double" power on the controller board of the WD3200JD. So, in this article we are going to compare SerialATA WD Caviar SE models of the last two generations (see above) and a new model with parallel interface WD3200JB, which is practically identical to our hero of the review. 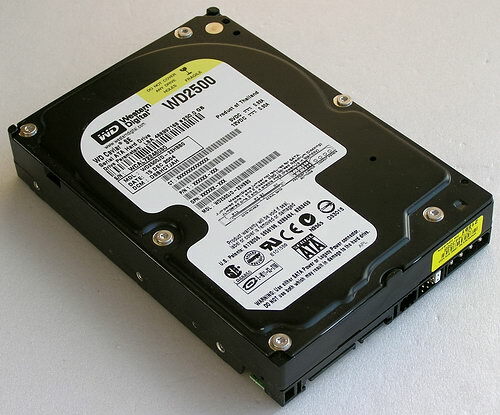 Besides the basic usage of WD3200JD and WD2500JD in desktop computers, we shall also review their operations in Quiet Seek mode, in which these hard disks are supposed to be used mostly in consumer devices — the seek noise of these drives in this mode is almost indistinguishable against the spin noise even according to the specifications. I will also provide the WD Raptor WD740GD results (74 GB, SerialATA interface, 10000 rpm). Even though it belongs to Enterprise rather than to Desktop segment of hard disks (it offers a proper reliability index, guarantee, performance, and price), it will be interesting to us as a registration target for SATA hard disks. The present 7200rpm models almost catch up with Raptor in terms of linear read/write rates. In this case (WD3200JD and WD740GD) they use the same interface and buffer size, their differences will be up to mechanics/geometry. 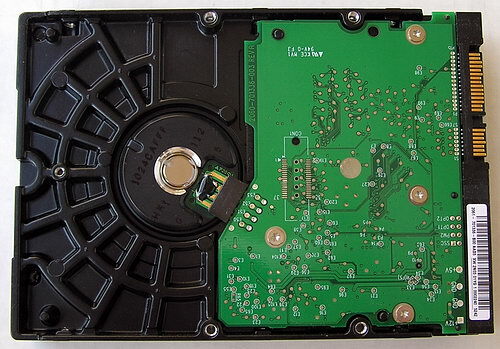 The hard disks were firmly fixed on the metal chassis of the PC case and connected to SerialATA and UltraATA/100 controllers on the ICH5 bridge of the motherboard. 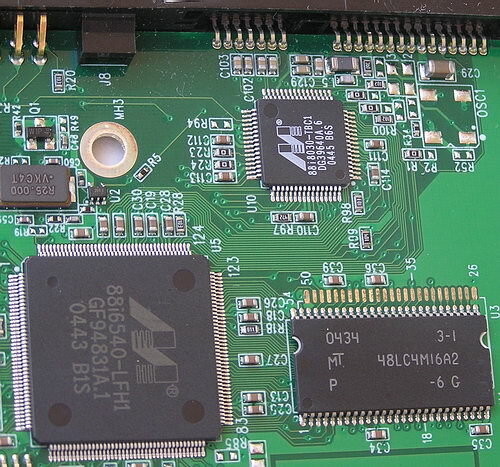 The main hard disk was installed as master on the first channel of the chipset controller, and a hard disk to be tested was installed as master on the second channel of the same controller. All the hard disks tested in this review had no problems with overheating and deterioration of characteristics at least during the six days of intensive testing. No additional cooling (special coolers and fans) was provided for the hard disks. Before the tests, we warmed the hard disks for 20 minutes using a utility with active random access. The tests were carried out under MS Windows XP Professional SP1. The hard disks were tested not partitioned (in Intel Iometer, H2Benchw and AIDA32 tests) as well as partitioned and formatted by regular operating system tools depending on a test type: one NTFS partition of maximum size for testing the average access time and plotting the read speed graph in WinBench 99 and two NTFS or FAT32 partitions of the same size for other tests (WinBench Disk WinMark 99, copying files with various patterns, ATTO Disk Benchmark test, multithreaded read/write Nbench 2.4 test and the hard disk speed test in Adobe Photoshop). Each NTFS partition occupied half of the entire disk capacity (that is the second partition started exactly from the second half of the disk). FAT32 partitions were 32768MB, the first one starting at the outer edge of the media (on the "fastest" tracks), and the second — exactly from the middle of the media volume. NTFS and FAT32 cluster sizes were selected by default — 4 and 16 KB correspondingly. We used AIDA32, H2benchw, and WinBench 99 tests to find out physical characteristics of drives (average access time, interface transfer rates, and linear transfer rates of the platters). To estimate the overall performance we use multiple patterns from Intel Iometer, a good test C'T H2Benchw, Adobe Photoshop swapping performance, multithreaded read/write, and the generally recognized WinBench 99 (though we don't pay much attention to the latter in our conclusions, because we have often found out about drive optimizations for this test). At first let's see the linear read rate graphs of WD hard disks. The WD3200JD graph is expectedly nearly identical to the WD3200JB graph (if we don't take into account that the latter is slightly uneven) and it noticeably "outperforms" the WD2500JD graph (this model has been manufactured not long ago, it's based on 80GB platters): the linear read rate has grown almost by 9.5% at the beginning of the disk, by 7.3% at the end of the disk, and by 8.4% at an average. Thus, the new Western Digital models based on 107GB platters outperform nearly all their competitors and catch up with Seagate hard disks on 133-GB platters in linear read/write rates. But they are still outperformed by the Raptor by 8% in the fastest part of the hard disks, 16% at an average (though their platters are so different) and even 32% at the slowest tracks. UltraATA/100 and Serial ATA data rates brought no surprises — the WD3200JD is approximately on a par with the other hard disks. But, strange as it may seem, it's outperformed by its two predecessors (WD2500JD and WD740GD) nearly by 10 MB/s — it may be the effect of the new processor, used in the hard disk. The WD3200JD also brought no surprises as far as the real average access time is concerned — it's similar to the WD3200JB and WD2500JD. We can note that 7200rpm models from WD are nearly the fastest hard disks among their competitors in seek mode, they are only outscored by Hitachi drives. Of course, there is still a long way to Raptor. As we have already mentioned, WD Caviar SE drives from the latest generations officially support the seek acoustics (and performance) control via the Acoustics Management register. WD has worked hard on this issue the last year resulting not only in a significant spin noise reduction, but also in an expert approach to the seek performance/acoustics management policy. As a result, the WD3200JD and WD2500JD models reviewed here officially support two seek modes — high-performance Mode 0 and quiet Mode 3. The former (default) mode is enabled when 254dec or 255dec is written to the register (255dec for the WD3200JD and the WD2500JD by default) and the latter — when the register contains 128dec. An attempt to write any other value to this register (from 129dec to 253dec) results in the register automatically resetting to 128dec (that is the maximum quiet seek). Unfortunately, the acoustics management utility from Western Digital is not yet freely available (though it already exists), so we shall use Hitachi Feature Tool under DOS and Abacus HDD Acoustic Manager (hddacman) under Windows 98 in our acoustics tests. Interestingly, when a hard disk goes into the Quiet Seek mode, the average access time of the new WD3200JD model grows by about 4 ms, while the same figure for the previous generation was about 7 ms. The active seek noise in these modes is hardly audible in these drives, so they can be successfully used in consumer electronics. Fortunately, the effective caching algorithms, optimized for given tasks, are also used in these WD hard disk drives. In particular, we can judge about their efficiency by the lazy write procedure, evaluated by the read/write access time ratio in C'T H2benchW. The new Caviar SE generation is noticeably better in this respect compared to their direct predecessors — the effective write access time (to a storage device under Windows) is improved by nearly 2 ms (they are equal in reading). It gets almost no worse in the new WD3200JD model in quiet seek mode, while the deterioration in the preceding WD2500JD was significant. Another interesting fact, this parameter turns out a tad better in the SATA modification of the WD3200 than in the same UATA WD3200JB model — it's probably the effect of the interface performance advantage. ATTO Disk Benchmark results for the WD3200JD and the WD2500JD are almost identical to their UATA counterparts, published in the previous review of WD hard disks (which is not at all surprising ;)). That's why we are not going to publish them here and will proceed right to performance tests in applications. At first, let's find out how well these hard disks are optimized for multithreaded operations (NBench 2.4, which writes and reads 100MB files in several simultaneous threads — located both near and far from each other on a hard disk (FAT32 is used in this case). This diagram allows us to evaluate the efficiency of multi-threaded lazy write procedures of the hard disks in real (not synthetic, as on the diagram with the average access time) conditions when the operating system works with files. It turns out that many manufacturers currently pay much attention to such optimizations, so WD hard disks do not take the first places here, though all the four contenders from WD demonstrate almost the same average results (is stability a sign of skill? :)). However, the WD3200JD outperformed its predecessors, but not much. While multithreaded write procedures get obviously worse in quiet seek mode in the WD2500JD, the WD3200JD demonstrates almost no deterioration — that supports our conclusions about the progress in lazy write algorithms drawn from the average write access time tests of the new WD models (see above). Maxtor and Samsung are again leading in multithreaded reading, though WD Raptor managed to take the second place and the WD3200JD goes on a par with its UATA counterpart right after the winners. The new models noticeably outperform the old Wd2500JD here. Quiet Seek mode in the WD3200JD has almost no negative effect on multithreaded performance, while deteriorations in its predecessors are obvious. Now let's pay our debt to the old but still popular Disk WinMark 99 from WinBench 99. We carry out these tests not only for the beginning but also for the middle part (in terms of capacity) of physical hard drives for two file systems. The diagrams display average results. And now — newer complex performance tests in PCMakr04 and C'T H2BenchW benchmarks. They both "play back" prerecorded hard disk activity (access) scripts in corresponding applications and measure the completion speed of each track, and then they average the results. The disk test in popular Futuremark PCMark04 is often used by common users for express-evaluation, though it's not free from shortcomings. The WD740GD takes the lead here, though its breakaway from the nearest Hitachi 7K250 and WD Caviar SE is not so large. The WD2500JD is again faster than the WD3200JD/WD3200JB (the latter two models offer similar performance). The situation is brightened up by the fact that the new model turns out even a tad faster in quiet seek mode than in the default mode, while its predecessor gets noticeably slower in quiet seek mode. A similar picture can be seen in the other track test from C'T H2benchW. The only difference is that the WD3200JB turns out a tad faster than its SATA counterpart here (the error spread in this test is within 0.1 in case of multiple runs). On the whole, WD Caviar SE hard disks look very good in track tests compared to their main competitors. In Adobe Photoshop swapping performance the new models from WD (both interfaces) are almost identical and take the lead, having been outperformed only by the Raptor and Maxtor with 16MB buffers. They suffer almost no performance loss in Quiet Seek mode. The WD2500JD is significantly slower than its competitors, though it does not suffer from Quiet Seek either. We also use special patterns in Intel IOmeter to imitate hard disks operating in various applications. At first — traditional well-spread patterns, offered by Intel and Storagereview.com — DataBase, File Server, Web Server, and Workstation. they even slightly outperform the former "desktop-server" leader in some patterns. The Hitachi drive has a slight advantage only in the web-server test. According to the averaged results (three server patterns and four queues depths - 1, 4, 16, and 64), WD hard disk with SATA interface takes the lead in server patterns (we don't take into consideration WD Raptor — it's too fast at these profile tasks), having outperformed Hitachi 7K250 and Wd3200JB, to say nothing of the other competitors. Praiseworthy! Approximately the same picture can be seen in the workstation pattern (which is actually not so different from the above server patterns). Now it's turn for IOmeter patterns, which are closer to users of home PCs, as well as to hard disk usage intended by the manufacturer. In the imitation of random reading and writing large files (like mp3, video, large photos, etc.) the Raptor is again beyond competition (though it's not the fastest in reading already), but the previous WD2500JD takes the lead again among desktop 7200rpm models, having outperformed the new WD3200 models. As we cannot accuse previous models of special firmware optimizations for this proprietary pattern ;), I can just repeat our conclusions from the previous review of WD hard disks about firmware defects in the new WD Caviar SE models, which use the new signal processor. However, the WD3200JD does not look so bad against its competitors here, having outperformed many models. The situation with the WD3200JD gets slightly better in the imitation of random reading and writing small files — it almost catches up with its predecessor (WD2500JD) and evidently outperforms its UATA counterpart. WD hard disks are outperformed only by the Hitachi 7K250 here, which is not surprising considering the least seek time in the latter. What concerns the imitation of file copy, we can see an obvious improvement of the corresponding algorithms in WD hard disks: the new WD3200JD outperforms its predecessor (WD2500JD) by 30% at an average (and almost by 40% at large files). It cannot be explained by the increased linear read rates. The WD3200JB is only slightly outperformed by its SATA counterpart. From this difference we can draw a conclusion that a faster interface allows caching buffer calls more efficiently and the firmware in new models uses a more efficient approach. On the whole, the WD3200JD outperforms almost all models here, though the unique results of the Samsung hard disk suggest an idea that WD programmers may still improve their approaches to these operations. The situation with defragmentation resembles copying files — the WD3200JD is again one of the fastest hard disks, having slightly outperformed the WD3200JB and noticeably — the preceding WD2500JD. 7200rpm models from Maxtor and Samsung are confident leaders with a large gap from their competitors in the streaming read/write pattern with large or small blocks (which characterizes PC operations when editing digital video or digital VCR mode with timeshifting as a fashionable consumer electronics device). WD Raptor is behind them, followed by... the WD2500JD, which outperforms the new WD3200JD and WD3200JB models by 8% (even in Quiet Seek mode). It's another proof that, having switched to a new elementary base, WD programmers didn't manage to fully adapt their previous hard disk algorithms and to get at least the previous performance in certain tasks. Due to its unique WhisperDrive technology, WD managed to minimize the noise in WD Caviar SE of the latest generation to levels virtually below the threshold of human hearing against other fans operating in modern computers. But if your computer is very quiet, you will still make out a low spin noise in the WD3200JD and the recent WD2500JD. The latter hard disk becomes almost inaudible in Quiet Seek mode on the background of the spin noise, though its performance in most desktop and consumer tasks suffers almost no losses. What concerns the power consumption and heat dissipation, you can look them up in the table with specifications at the beginning of the article. They are really much better than those in their main competitors. The new WD Caviar SE drives rarely get heated over 40-45 degrees, in case you organize thought-out passive cooling. On the whole, WD Caviar SE drives of the latest generation are nearly the quietest and coolest among their direct competitors. So, our examination of the new WD3200JD with SerialATA interface on 107GB platters backs up our conclusions drawn in the WD3200JB review: Western Digital has successfully mastered 107GB platters in its desktop and consumer hard drives. 320 GB WD models are now the second in their capacity on the market (after 400 GB models from Seagate and Hitachi). WD will soon indulge us with 400 GB models, based on a similar technology. As a rule, models from competitors are much less quiet and hotter than similar WD models. The latter demonstrate outstanding performance almost in all the tests! The WD3200JB/JD drives with their current price of about $200 are an excellent choice for those PC users, who want a high-performance system of a high capacity, which will still be quiet and relatively cool. A little disappointment: the new WD hard disk is faster than its predecessor (WD2500JD, manufactured not long ago on 80GB platters with an old controller) only in half of the performance tests in various applications. The other half of tests is dominated by its predecessor! This will surely alert a careful customer. And we shall try to keep abreast in the situation with the appearance of new versions of WD products.